Nineteen outstanding high school seniors and one transfer graduate student have signed national letters-of-intent, grants-in-aid and/or offers of admission to UCLA, Bruin head football coach Jim Mora announced today. Thirteen of the prep players attended high school in the state of California, three in Texas, and one each from Louisiana, Colorado and Indiana. The class is ranked No. 18 by Rivals.com, No. 19 nationally by Scout.com, and No. 27 by ESPN. Three-star recruit according to rivals.com … Rivals’ No. 69-ranked prospect in the state of California … Three-stars from scout.com … Scout’s No. 33-rated middle linebacker nationally, the No. 68 overall prospect in the state of California and No. 95 recruit in the West … PrepStar All-West Region … CalHiSports.com 1st team All-State Small Schools … First-team CIF Los Angeles City Division III and Player of the Year … As a running back, he ran for 136 yards and three touchdowns in the 2013 City Section Division III championship game … Invited to participate in the Semper Fi Game. A three-star recruit according to both scout.com and rivals.com in 2013 who enrolled at UCLA in January of 2014 … The No. 57-ranked cornerback in the nation according to scout.com … No. 13-ranked corner in the West … PrepStar All-West Region … Selected to play in the Offense-Defense Bowl in Houston … Listed No. 84 on the scout.com West 150 … Rated No. 91 prospect in the state of California by rivals.com … As a senior, he made 55 tackles, seven interceptions and scored 18 touchdowns … As a junior, he made 40 tackles … Had 10 punt returns for 231 yards and 10 kickoff returns for 179 yards … Rushed for 493 yards and six touchdowns and caught 15 passes for 150 yards and a touchdown … Coached by Robert Garret. Three-star recruit according to rivals.com … Rivals’ No. 55-ranked wide receiver in the country and the No. 44-rated recruit in the state of California … Three stars from scout.com … Scout’s No. 69 wide receiver nationally, the No. 40 recruit in the state of California and No. 59 recruit in the West … PrepStar All-West Region … Three-star athlete according to 247Sports … As a senior, he caught 34 passes for 833 yards and 14 touchdowns … First-team All-CIF Western Division. Four-star recruit according to scout.com, the nation’s No. 110 prospect, the No. 11-ranked prospect in the state of California and No. 20 recruit in the West … Scout’s No. 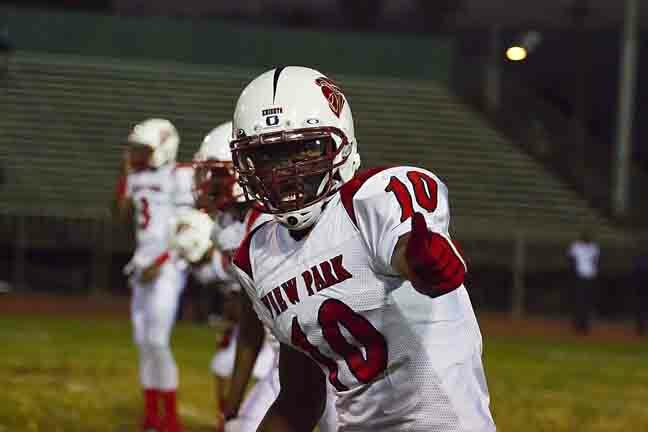 14 defensive end prospect nationally … First-team All-CIF Pac-5 Division … Four stars according to rivals.com … Rivals’ No. 15 weak side defensive end in the nation and the No. 32 prospect in the state of California … PrepStar All-West Region … Credited with 108 tackles, 12 sacks, two forced fumbles and three fumble recoveries as a senior … Named to Long Beach Press-Telegram Dream Team first-team defense … Led team to undefeated season and the Open Division Bowl Game title. A four-star recruit according to rivals.com and the No. 80 recruit in the nation … Four-star recruit according to scout.com, the nation’s No. 97 recruit, the No. 10-rated prospect in the state of California and No. 19 prospect in the West … Scout’s No. 8-rated safety prospect nationally … Rivals’ No. 7-ranked cornerback prospect in the nation and the No. 8-rated recruit in the state of California … Four-star athlete and ESPN.com’s No. 288-rated recruit in the nation … First-team All-CIF Pac-5 Division and Defensive Player of the Year … Second-team MaxPreps All-America selection … PrepStar All-West Region … L.A. Times Player of the Year … Long Beach Press-Telegram Dream Team Player of the Year … Caught 78 passes for 1,293 yards and 20 touchdowns as a senior … On defense, he recorded 144 tackles and picked off three passes … Helped team win the CIF-SS Pac-5 championship and the 2013 State Open Division title … Selected to play in the U.S. Army All-American Bowl. Three-star recruit according to rivals.com and scout.com … Rivals’ No. 25-ranked outside linebacker in the nation and the No. 41-ranked recruit in the state of California … Scout.com’s No. 42 prospect in the state of California and No. 61 recruit in the West … Scout’s No. 36 outside linebacker prospect nationally … Listed as a four-star athlete and the No. 180 prospect in the nation by ESPN.com … PrepStar Top 150 Dream Team … First-team All-CIF Western Division … As a senior, he made 91 tackles, 14 tackles for loss, eight sacks and five interceptions … Selected to play in U.S. Army All-American Bowl.